Whew! I'm finally caught up Tim's Tags and what do you know, I'm improvising again! Before I do, I wanted to share with you the picture I took this morning of the sunrise, isn't it beautiful! Day 7 - The Poinsettia is created following Tim's directions, EXCEPT I only used Grungepaper, painted with Red Pepper Daubers, then added some Perfect Pearls Mist. 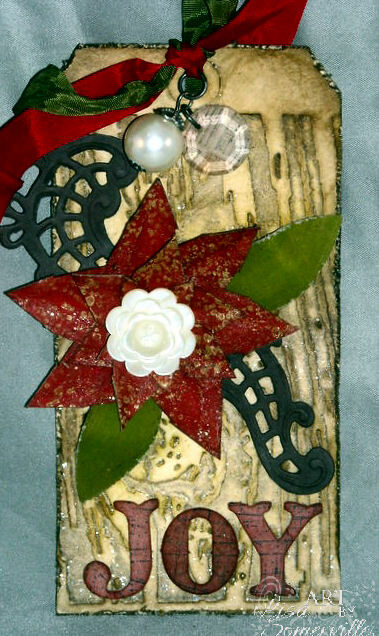 The leaves are die cut with Heartfelt Creations Perfect Petals Die from Grungepaper then Painted Lettuce, the Brown accent is part of the Heartfelt Creations Decorative Window Scene Die. 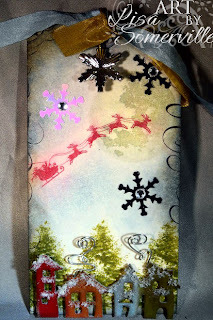 I'm playing along at The Artistic Stamper Challenge and at ArtyJen. They are all fantastic, but I have to say the top one is my favorite ... love how you combined all of the different images ... fabulous. Great job on your tags! They look like fun! Beautiful photo too! It's nice to see what sunrise looks like since I don't get up that early....! 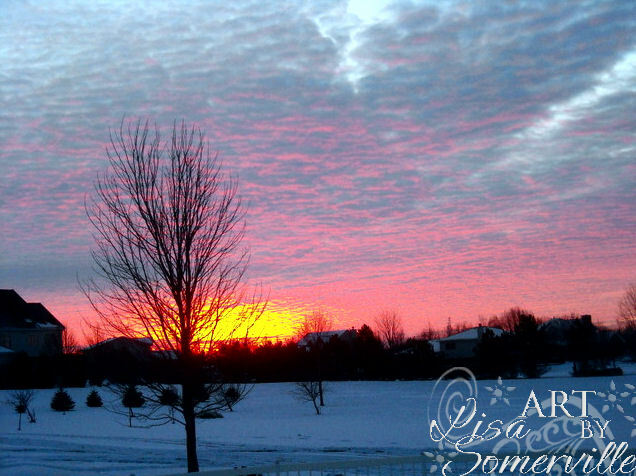 Beautiful sunrise and you have snow-we only have rain. All of your tags are wonderful! Your houses and Santa. (I do the spread the ink thing all the time) The Artistic Outpost stamps are kind of Timmy I think. I love the swirl behind your flower in tag 3. Way to go! You have been busy! All three are spectacular and just love your take on Tim's tags! Being from Upstate NY, I remember snow and skys like that. Of course, they lasted for five months!! These tags are awesome Lisa! I love all of them!!!! So different, and all of them SO cool!!! Think they are all fab tags, and I love your photo! Oh wow Lisa these are totally fabulous. I love your originality, way to go girl. Brilliant. Wow, you sure were busy, beautiful tags, but my fav is the first one, great! What a beautiful photo too! Beautiful tags, Lisa. You are a very talented lady. Waking up to that beautiful sunrise-WOW!!! The tags are wonderful too, love how extravagant they all look. Oh My Goodness Lisa, I love Day 7 and 8 tags... Outstanding! Great tags - love that Santa stamp and your row of houses!! Gorgeous trio of tags! 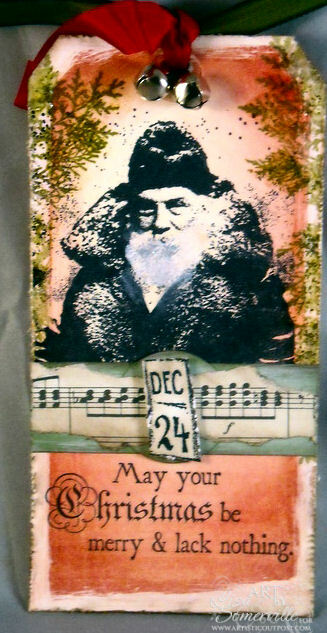 The santa image is perfect on your first tag. 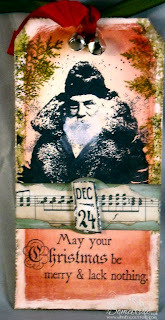 Love the black flourish on your second tag and the colors on your third are beautiful! Pat yourself on the back girlfriend, these tags are really works of art!! Just gorgeous!! I wish my sun rises looked like yours, then it wouldn't be so hard to get up at 4 AM. A fabulous set of tags and love all the improvisations.